Richard Stockton, eldest son of John and Abigail (Phillips) Stockton, known as "The Signer" because he was a member of the Continental Congress and one of the 56 Signers of the Declaration of Independence, was a graduate of the first class of the College of New Jersey (now Princeton University) in the Class of 1748. He was admitted to the Bar in 1754 and soon acquired a reputation as a great lawyer. He was Judge of the Supreme Court and a member of the King's Council for New Jersey, before the Revolution in 1776. After twelve years of active practice in Princeton, he visited England in 1766-7 where he stayed for sixteen months. While in Scotland, he and his wife, Annis Boudinot Stockton, prevailed upon Dr. John Witherspoon and his wife to accept an offer of the Presidency of Princeton College, for which, and other services to the college, he received the formal thanks of the trustees upon his return. In company with Dr. Franklin, he consulted with the merchants of London on the subject of paper currency and the act of Parliament prohibiting its issue. On June 21, 1776 he was chosen by the Provincial Congress of New Jersey one of the delegates of the Colony to the Congress which promulgated the Declaration of Independence. On the 30th of November following, he was again made one of the five delegates from New Jersey. The minutes of the Continental Congress show that he took an active part in the work of the Congress, being frequently appointed on important committees with Thomas Jefferson, Benjamin Rush, Robert Treat Paine, Francis "Lightfoot" Lee, and others. On September 26, 1776 the Congress appointed Richard Stockton and George Clymer as a committee to go to Ticonderoga and report upon the state of affairs there. They were away on this mission for two months. They visited the headquarters of the American Army, then proceeded to Albany where they were joined by General Schuyler, who accompanied them to Saratoga. They went to Fort George and inspected the hospital there, and on to Ticonderoga. With General Gates they met the Commissioners from Massachusetts Bay and had an important conference. They wrote two letters to John Hancock reporting on their actions, both in Richard Stockton's handwriting but signed by George Clymer as well. Upon his return from this mission, Richard Stockton found his family and home in danger, Lord Cornwallis being on the march across the Jerseys and Princeton lying in the direct line of advance of the British Army. He and his family took up their residence temporarily at the house of John Covenhoven, in Monmouth, NJ, and it was there, on November 30th, 1766, that he and Mr. Covenhoven were made prisoners of war by a party of Loyalists. Richard Stockton was taken to New York, thrown into the common jail and treated with severity. Learning of this, the Continental Congress, on January 3rd, 1777, protested this inhumane treatment of a member of that Congress and asked General Washington to protest to General Howe about the matter. Shortly after this, Richard Stockton was exchanged, but his health was much broken and he never regained it. The family estate "Morven" which he had made one of the most beautiful in the Colonies, suffered severely during the Revolutionary War. His library, one of the best in the country, was burned, the lands laid waste, the furniture burned, and the livestock driven away. The plate and other valuable articles had been packed in boxes and buried in the woods at some distance from the house, but, through treachery, two of the boxes were discovered and fell into the hands of the British soldiers. The family recovered the third one. The depreciation of the Continental currency, in which Richard Stockton invested large sums, further reduced his fortune. Among the friends of Richard "The Signer" were a number of the most eminent public men of his day. He was a devoted friend of George Washington, who was a frequent visitor at "Morven". He and the Honorable Elias Boudinot each married the other's sister; and the celebrated Dr. Benjamin Rush, of Philadelphia, was his son-in-law. He married Annis Boudinot, sister of Elias, of a French Huguenot family. After the war, upon the organization of the State governments under the Confederation, Richard Stockton received on the first ballot an equal number of votes with William Livingston for Governor of New Jersey, but Livingston was finally chosen. He was then unanimously selected for Chief Justice, but declined for health reasons. He died soon after, at Morven, on February 28, 1781. 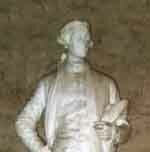 An oil portrait of him, by Peale, hangs in Independence Hall, in Philadelphia, and in 1888 the State of New Jersey placed his statue, by Henry Kirke Brown, in the Capitol in Washington, one of the few artistic statues there. Annis Boudinot Stockton survived her husband, and died February 6, 1801 at White Hill, Burlington County, New Jersey (home of son-in-law, Robert Field). She was a woman of very considerable literary attainments. She wrote a drama called "The Triumph of Mildness," besides odes and poems, and contributed to a number of periodicals. She corresponded freely with Washington, and wrote many poems about his actions. Many of her poems have been published by University Press of Virginia, 1995: "Only for the Eye of a Friend, The Poems of Annis Boudinot Stockton", Edited and with an Introduction by Carla Mulford. In addition, Annis Boudinot Stockton's poem "Forbear Unkind Ungenerous Muse" appears in "Second to None: A Documentary History of American Women, Vol. I: From the 16th Century to 1865", Edited by Ruth Barnes Moynihan, Cynthia Russett, & Laurie Crumpacker, University of Nebraska Press, 1993, Pgs. 150-151. This poem was a contemporaneously published (1759) reply to a published poem insulting to women. Julia Stockton - b. March 2, 1759, d. at Syndenhain, July 7, 1846, m. January 1776 to Dr. Benjamin Rush, of Philadelphia*. Had two sons. Mary Stockton - b. April 17, 1761, d. March 18, 1846, m. Rev. Andrew Hunter, October 13, 1794. They had three children: two sons, one daughter. Susan was her twin sister. Susan Stockton - b. April 17, 1761, d. October 2, 1821, m. after 1793 to Alexander Cuthbert of Lanorie, Canada. No children. Mary was her twin sister. Richard Stockton - "The Duke". B. April 17, 1764. Lucius Horatio Stockton - b. at Morven, d. in Trenton, May 26, 1835, m. Sarah Milnor and they had one daughter. Abigail Stockton - b. September 8, 1773, d. June 13, 1858, m. Robert Field of White Hall, Burlington County, NJ, January 10, 1796. They had six children, two sons and four daughters. * Dr. Benjamin Rush was also a signer of the Declaration of Independence. Those interested in further facts about this eminent physician can consult almost any library.